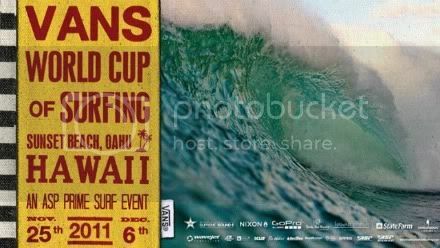 Vans World Cup of Surfing is the second jewel of the Vans Triple Crown of Surfing. 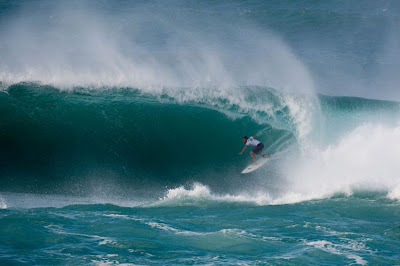 Held at Sunset Beach, the big wave event is steeped in tradition. The event waiting period runs November 25th - December 6th. Stu Kennedy and Adam Melling will be in the event chasing some big walls and big points. Good luck fellas. A developing frontal storm will slowly track across the North Pacific, where it will soon merge with a complex system already in place over the Gulf of Alaska. The storm-fetch will strengthen some through the next 24hrs, while pushing toward the Hawaiian Islands. Therefore, we're expecting a new and solid pulse of NW-NNW swell (320-355 deg) to rapidly build in late Saturday and peak by Sunday morning for the North Shore. At this time, we're looking for overhead+ sets to rise up for Sunset before dark on Saturday. 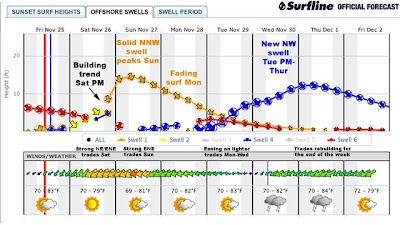 By morning on Sunday, we're expecting double to triple overhead sets with occasional bigger waves. 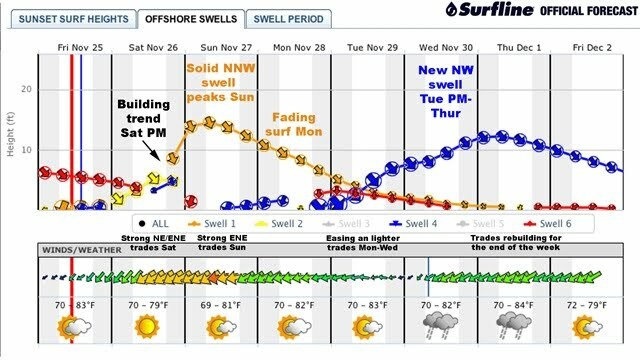 This swell will then steadily drop off through the first part of next week. Lay day today. 12'+ tomorrow. Stu threw himself into the Sunset maelstrom but Huey didn't send him any good ones and he was eliminated only chasing a small score. Bad luck mate. Swell bigger today but not big enough. Lay day. 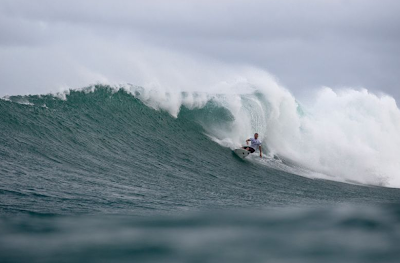 Mello has finished 3rd at the Vans World Cup of Surfing. In the round of 32 and the quarter finals Adam was in total control threading pits and laying rail like a champ. The semi was tighter but he held his composure and progressed in 2nd. In the final Mello stayed busy but didn't start getting the higher scoring waves until last 10 minutes. Adam took off and pulled into the biggest pit of the contest and charged through its warping sections only to get swatted just before the exit. It would have been a guaranteed 10 but Sunset wasn't going to give it to him today. This result will move him up the World ranking a couple of spots and he is still in 2nd for the Triple Crown on 9650 with Jon Jon on 9780. Pipe will decide. 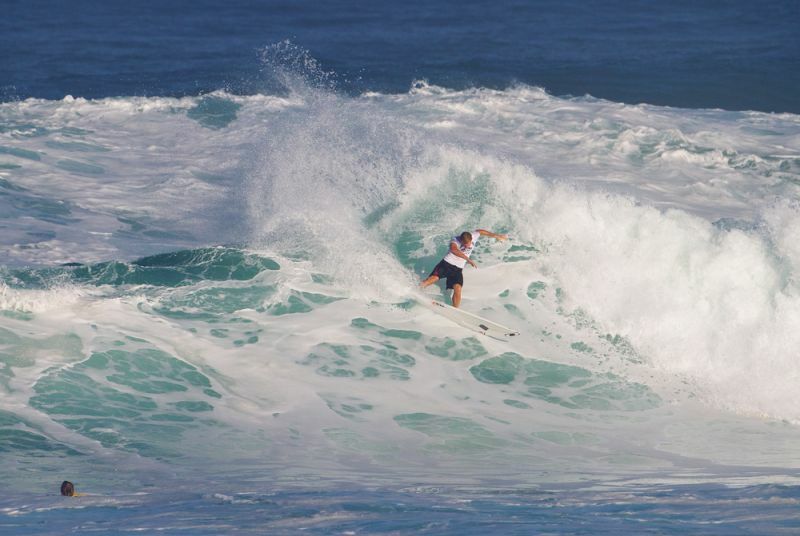 Congratulations Mello on another exceptional result and a stellar Hawaiian season.